For the last three years running, ACS Creative has earned the accolades of its industry peers. We are grateful for the judges who think so highly of our work, and we are doubly grateful for the clients who trust us with their brands and allow us to do great things. Our Addy Awards (Addy’s) are not the result of one creative mind. It takes a team effort, agency and client working together, to develop ideas that lead to designs that garner awards. You might say the real winner here is our customer service. 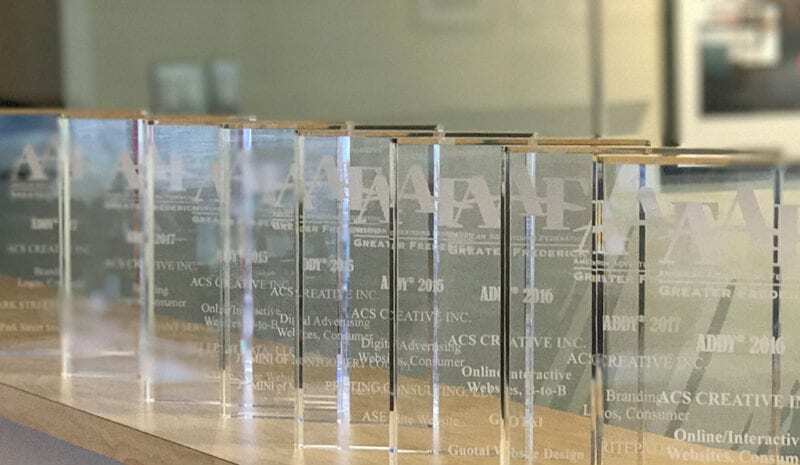 You also might say that three years of wins means we can proudly state: ACS Creative, an award-winning branding agency. We hope you don’t mind if we do. But wait, what is an Addy Award? For those of you unfamiliar with the moniker, Addy is the affectionate nickname given to the awards presented by the American Advertising Federation (Ad Club). The annual event, which draws over 40,000 entries per year, is the advertising industry’s largest and most representative competition. Ad Club recognizes winners through a tiered system at both local and national levels. The Addy’s primary mission is to recognize smart, artistic and creative work across the U.S.
It’s an honor to be included among the distinguished group of agencies that were recognized for their outstanding work in 2016. ACS Creative has been developing successful brands for clients for decades. It was no surprise then that the judges chose to give us two Addy Awards in the areas of branding & identity. The third win was for web design — one of our core competencies. It is particularly satisfying to be acknowledged for the things you do well. The ACS team spends much time honing their design skills and staying ahead of industry trends and best practices. Not to win awards, but to help our clients meet their business goals. The trophies are just icing on the cake! The logo that garnered the most acclaim was designed by us for a company named Britepaths — which was a new name as well. The company, originally called Our Daily Bread, has been around for more than 30 years and is dedicated to developing sustainable solutions that meet the challenges of low-income working families through emergency assistance, financial literacy and one-on-one mentoring. A great cause worthy of a great logo. We went to work gathering brand insight, developing a name and finally crafting a logo. The process was harmonious collaboration between agency and client. It couldn’t have gone smoother. Probably why the end product turned out so good. Here’s the winning logo. We like it and, more importantly, Britepaths likes it! Trust us, it’s not as easy as it looks—which is why we are so pleased with our Addys. Hard work does pay off. Hire an award-winning agency by getting in touch with us today and see what makes a good brand great.